I often hear people express great concern over what is going to happen to orphaned, unwanted children or children from broken homes or who have parents who cannot care for them. Some very caring adults become troubled over the future of those children. Somehow I get the impression that those adults feel as though, if they don’t step in, the lives of those children will be damaged beyond repair. They’re doomed. The heart in the adult who thinks like that is very honorable and lovingly kind. However those kinds of situations do not trouble me. Yes, a wholesome, Christ-centered home is God’s best, but otherwise does not spell doom. 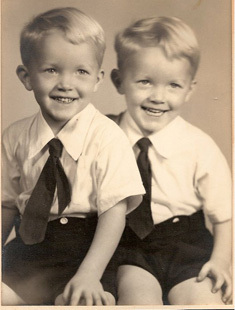 Since that’s the background my twin brother Len and I came from…a broken home. We grew up in orphanages. We spent our first year with foster parents because of post-birth complications that disabled our mother. After that, because she had to work, we would have been left alone so she placed us in orphanages. They were quite common in those days. While we don’t know our father we did know our mother. There is much we don’t know and probably will never know about our family history. Our children have done some research and because of their interest discovered a source through which I could have some DNA tests done. Although not completely surprised, we discovered that my brother and I are not actually Nair’s. (That’s a story in itself.) We are instead members of a small branch of people in Switzerland named Miller. We recently discovered the location a man who we believe was probably our father only to find that he had died the month before our discovery…which means we may never be able to verify it. We have not been able to make contact with his children to find out if he had ever mentioned anything about his past that would help us know the truth. I mention all that in order to say that those two infant children…unable to bond with their mother or father…left alone in orphanages…where many offenses were committed against them…did not go unnoticed by God. If we were born in biblical days we would have been considered illegitimate children. We would not have been allowed to participate in temple worship duties. We would have been outcasts. But we are living proof that we were never abandoned by God. He always had His eyes and His hand on us. Both my brother and I have accepted Jesus Christ as our Savior. (When I think about it, I get a mental picture of God holding His nose as He reached down and gently lifted us out of the garbage heap.) I also remember so many times when I did such stupid things that it could have, and even should have, cost me my life. And He spared me because although I would not have been qualified to serve in the priesthood, I have been able to serve Him and His church. I have had the privilege of serving Him and touching lives throughout the world, but that was not my goal. Having no family background, I knew nothing about relationships, women, siblings or marriage…nothing. I was a “blank slate” when it came to those things. I believe God’s goal was/is that I study His Word to establish my understanding of His ways. I believe He wants that for everyone…no matter what their background. God is not limited in His ability to use those who are willing to yield to Him. As a result of all those life experiences, we at Life Partners Christian Ministries are offering Christians the opportunity to return with us to the brand of Christianity the Apostles died for. Join us in this mission today!